How does one go about trying to describe the supernatural allure of THE BERMUDA DEPTHS, a 1978 made-for-television film that has cast a lingering hypnotic spell upon anyone fortuitous enough to stumble across it? (Is it too much to suggest that the secret reason for the existence of the Internet itself is so that these chosen people could track down a bootleg copy of their gospel?) This is a film that centers on a giant turtle folks, conventional wisdom would tell you that all recognitions would paint it as a camp classic or at least a guilty pleasure by now, but instead its followers, old and new, hold this oddity closely and sincerely to their hearts like a priceless family heirloom. Part of the reason may be because THE BERMUDA DEPTHS defies categorization. Actually it may be more accurate to say that there is no genre that it does not embrace at one point or another, horror, fantasy, and action all weaved together with an undeniable leaning toward tragic romance and yes, I’m still talking about a movie involving a giant turtle. Some who have experienced this lush fable in their youth admit to confusing their memories of it with a childhood dream and it’s not difficult to understand why. The soundtrack alone mystifies. Prepare to have it rustling about your brain like a hermit crab trapped in a tide pool for days after viewing. The movie itself begins as a dizzy stumble between dream, reality and the inchoate memories of youth. Magnus (LEIGH McCLOSKEY of ARGENTO’S INFERNO) is recalling a first love, a little girl named Jennie Haniver he used to play with on the beach. One day the two find a turtle egg. 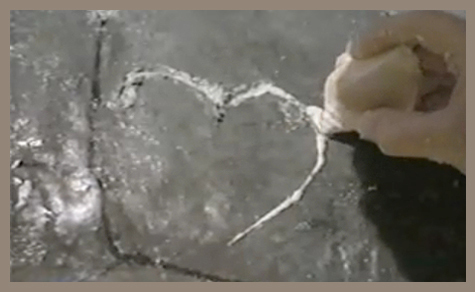 They nurture the newborn into semi adulthood and send it off to sea but not before Magnus etches his feelings upon it’s shell carving “M + J” within a heart. Reciprocating these thoughts, Jennie crafts a necklace from coral and presents it to Magnus. That night a storm rages and an unseen beast attacks and makes off with Magnus’ scientist father leaving their ocean adjacent cliff-top home a REBECCA-like Manderlay shambles. Now an adult Magnus has returned to his childhood home and is still unclear about what had befallen his father. He keeps coming across a mysterious woman (a surprisingly ethereal CONNIE SELLECA) who he slowly begins to realize is the girl from his youth. 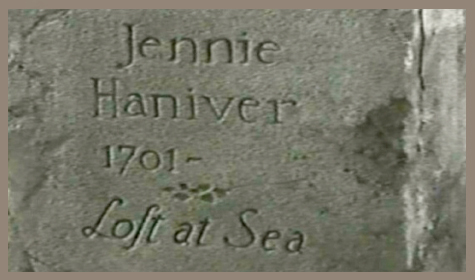 Problem is he’s also informed that the name Jennie Haniver belongs to that of a local legend, a woman who sold her soul in exchange for eternal life during a storm at sea. It is said that she can appear as either an adult or a child, and that all those that she presents herself to are doomed to drown. Meanwhile, another childhood buddy (CARL WEATHERS) and an acquaintance of Magnus’ father’s (BURL IVES) are currently getting all kinds of JAWS-obsessed about some giant turtle foot prints they discovered in the sand. Sounds crazy, I know, but somehow it all comes together like some ancient myth written in the stars. This is a story that could touch anyone at any age. Adults will recognize the bittersweet melancholia of an impossible love. Teenagers get a crashing helicopter and a hot babe with glowing eyes and kids, well kids get that cute giant turtle I was talking about. Grab the whole family, we’ve got a lost classic on our hands! Learning that DEPTHS was penned by ARTHUR RANKIN, JR. of RANKIN AND BASS (THE YEAR WITHOUT A SANTA CLAUS) fame first seems astonishing and then absolutely appropriate. NOTE: I don’t know how long it will last, but currently THE BERMUDA DEPTHS can be viewed on God’s gift to obsessive nerds Youtube (Part 1 is HERE, follow it to the rest). If you have any kind of free time at all today, I suggest you uncross your arms, relax and let it take you out to sea. This was an amazing review! I agree, it’s impossible to categorize this film. I guess I see it as a tragic fairytale and I’d put it up there with the classics. I just mentioned this movie on a blog post I wrote and without remembering the exact words, I said something to effect of it being visual poetry. It’s so calming yet so unnerving. Yeah, I just can’t describe it. You did forget to mention Carl Weathers in those lily white hot pants and half shirt! YIKES! He’s really hot, but I’m not sure even he pulled that look off!!! I was thinking about you when I wrote this one. I know TBD is one of your favorites so I tried to do it justice but I think the video we posted does a much better job then I ever could. It really is a difficult movie to describe properly you just have to experience it. It has come up again and again on Kindertrauma and I thought it was high time we gave it an actual post. Even though it’s not particularly traumatic the movie itself and people’s reactions to it really says a lot about the lasting power of childhood memories. I almost forgot…Here is a link to a petition to get THE BERMUDA DEPTHS on DVD! Very few movies can do that to a kid. Thanks for that great link, it’s a gold mine. I can’t get over how many people say that the movie effected their dreams (some say for years), that blows me away. There was a drowining scene in this that was a bit upsetting for me. It did help to have Connie Sellecca in a swimsuit! I was thirteen when this premiered and I have loved it since the night I saw it. Like so many others whose comments I’ve read on IMDB and other sites (like this one) this thing has haunted me, has maintained a presence in my mind for all these years. Unconsidered trifles which played no substantial part in the story, like the ruined house with its curtains blowing through the open windows, and the rocking horse and other debris in the yard, things like that which were for reasons unknown to me utterly captivating, and ingrained. Back in the teens and twenties they used to refer to various actresses as the ‘It Girl’ – she has some undefinable quality, some je ne se quoi thing which defies explanation; something that is genuine because it cannot be easily duplicated, lightening in a bottle, more than the sum of its’ parts, etc. This movie has *It*. A thirty year old mystery was ended for me on Friday, July 10th. It turns out I was ten years old when I saw a small portion of this movie during a bout of childhood insomnia. I would often sneak out of my room and watch TV from a hidden vantage point in the hallway. I saw the first half of the movie before I fell asleep and my parents carried me to bed. Something about it stuck with me. For the last few years I have tried in vain to find out what the hell I saw, and I finally struck gold when I typed in “70’s made for TV movies giant sea turtle” I almost could not believe it was real. Later that night, I told my wife what I found. She sat bolt upright in bed and shouted “Oh my god, I swear it was a dream! That was an actual movie?” Turns out the same thing had happened to her. Like other posters here, I cannot begin to explain what this film means to me, but I take great comfort in knowing that there are others out there with the same feelings. OH, MY, GOD. YOU KNOW WHAT, I WAS ABOUT 8 YEARS OLD WHEN I SAW THIS MOVIE AND NEVER SAW IT AGAIN. IT WAS LATE NIGHT AND I WATCH IT ALONE. I WENT TO BED WITH A GREAT SADNESS, BUT AT THE SAME TIME I FELT LIKE I SAW THE GREATEST MOVIE OF MY LIFE. I WAS LIKE INLOVE WITH JENNIE HANIVER. THE FOLLOWING WEEKS I FELT LIKE WHEN SOMEONE YOU REALLY LOVE DIES. IS PRETTY DIFFICULT TO DESCRIBE. SINCE THAT DAY THAT NAME IS ALL THE TIME IN THE BACK OF MY HEAD. I TOLD EVEN MY WIFE TO SEE IF SHE EVER HEARD OF IT BUT NOT. FROM TIME TO TIME I THINK ABOUT THAT MOVIE AND STILL FEEL SAD, IS INCREDIBLE. NOT UNTILL TODAY THAT I DECIDED TO FIND HER AGAIN. I HAVE BEING IN THIS COMPUTER FOR A LONG WHILE, AND FINALLY I FOUND THIS, I CANT DESCRIBE HOW HAPPY I AM. I WAS TOO YOUNG AND I DIDN’T REMEMBER THE TITLE OF THIS MOVIE. THANKS, YOU GUYS RETURNED TO ME A REALLY BEATIFULL EXPERIENCE OF MY CHILDHOOD. Here’s the facebook fansite — more like a group theraphy! I did NOT expect to solve this mystery from my childhood when I happened upon this page today. That image of a giant sea turtle with initials carved into its shell has haunted me for decades! Guess I shouldn’t be surprised to learn I wasn’t the only one. Thanks again, Kindertrauma! Great review and great site! Thanks for both. You helped me connect with some deeply buried but potent memories, and you helped inspire my own blog (shagdaze.com), with the first post (and so far the only post) being a review of this wonderful flick. Let’s see if I keep the reviews coming. Meanwhile, I need to add my own kinder trauma moment to your site. It revolves around a psuedo doc from the late 70s called The Bermuda Triangle. I actually have a copy of the DVD! Let’s just say I met someone who’s parent worked at the studio in the 70s. If anyone is interested, email me at depnewshound@gmail.com. So, about 1977 this girl named Jenny started coming to my church. I was 9 and she was my first crush… oh, I was as crazy about a girl as a nine-year-old boy can be. But after a scant few months, her family moved on and I never saw her again. I was devastated. My parents got me a calico kitten, whom I named Jenny. Then, right about the time I turned 10 this movie came on TV… the theme song made me cry. Like everyone else, in later years I was left to wonder if this movie was even real… I couldn’t remember the name, only the song and how it reminded me of my first crush (whom nobody in my family remembers but me) … but here it is!